Sometimes a photograph will strike you in a certain way that makes it memorable. It has some intangible quality that makes it almost timeless. Of the thousands of images in our library, a handful qualify for this kind of distinction. Not for their physical clarity or skill of the photographer, but that certain look. You might describe it just a bit like looking at a Rockwell painting, or a black and white photograph by Ansel Adams. This image has a Little Rascals look and feel to it. 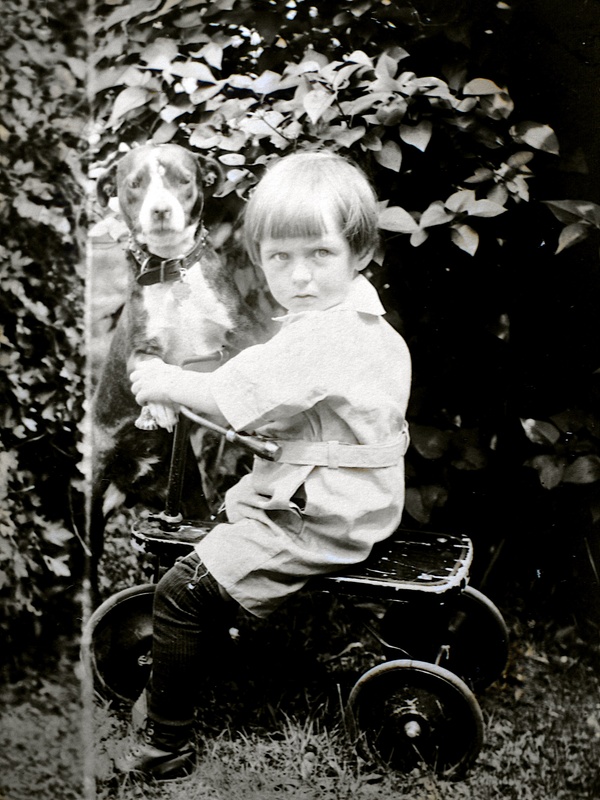 Toddler Elaine Treutel and the family dog on her tricycle, circa 1922. Elaine Treutel poses with the family dog in this ca. 1923 photo near Vesper, Wis. Directly behind her is older sister Ruby V. Treutel. Sitting on the bumper of the car is father Walter Treutel (1879-1948). The others are unidentified. Ruby V. Treutel (center) relaxes with the Sunday paper near Milwaukee’s Juneau Park in 1924. Ruby was visiting her fiance, Carl F. Hanneman (1901-1982), who was studying pharmacy at Marquette University. At front is Ruby’s sister, Nina H. Treutel (1914-2005). The woman near the car is unidentified. A formal portrait of Elaine Treutel of Vesper, Wis., circa 1938. Born in January 1920 to Walter and Mary (Ladick) Treutel of Vesper, Elaine attented Lincoln High School in Wisconsin Rapids. She married Max Clark in October 1938. The couple lived for many years in Madison, then relocated to suburban Phoenix, Arizona. Frank Herman Albert Hanneman (1895-1947) of Grand Rapids, Wis., posed for this studio photo with a shotgun, ammunition belt and even a hunting dog. The photo was taken ca. 1909. Frank was the son of Carl Frederick Christian Hanneman (1866-1932) and Rosine B. H. Ostermann (1874-1918). Nina Treutel of Vesper, Wis., is about 18 months old in this circa 1916 photograph. Nina’s parents are Walter Treutel and Mary Helen (Ladick) Treutel. A beautiful portrait of Lavonne Hanneman, circa 1955. Ruby Treutel poses for an informal photo, circa 1922. Ruby Treutel with her siblings Marvin, Elaine and Nina, circa 1921. Carl F. Hanneman’s high school portrait, 1921. Lavonne and David Hanneman examine a monument on a vacation trip to South Dakota in 1947. Ruby Treutel holds her baby brother Gordon, circa 1910. Gordon died of pneumonia in February 1911. Patricia Treutel is having a great time on the tree swing, circa 1943. We don’t have an ID on this beautiful young lady. Photo appears to be from 1920s. David D. Hanneman watches over his little sister, Lavonne, circa 1938. David D. Hanneman and sister Lavonne Marie Hanneman, circa 1942.